Studies of the enzyme fructose-1,6-bisphosphatase (FBPase) of rainbow trout (Oncorhynchus mykiss) have been undertaken in order to illuminate aspects of skeletal muscle gluconeogenesis in these animals. Maximal activities in crude homogenates of several organs suggest that the liver possesses the greatest FBPase activity on a unit g−1 tissue basis but that the white muscle, owing to its bulk, contributes substantially to whole body FBPase activity. Studies of fructose-6-phosphate-1-kinase (PFK) and FBPase in crude homogenates of several organs suggests an important role for intracellular pH in regulating the relative carbon flux through the FBPase/PFK locus in vivo. Furthermore, a three-step purification scheme is described for trout white muscle FBPase by which a stable and homogeneous (by SDS PAGE) enzyme preparation (isoelectric point = 7.2; molecular weight = 37.6 kd) was obtained. Kinetic studies of the purified enzyme were undertaken at 20°C under conditions reflective of "rest" and "exercise/recovery" intramuscular pH in vivo. Affinity for substrate (F-1,6-P2) was increased (Km = 6.88 versus 2.44 μmol 1-−1 as was enzyme activity when pH was lowered from 7.0 to 6.5. Various inhibitor metabolites are identified including F-2,6-P2 (mixed-type inhibitor, Ki = 0.201 μmol 1−1, pH 7.0) and AMP (non-competitive inhibitor, Ki = 0.438 μmol 1−1, pH 7.0). Inhibition by F-2,6-P2 was strongly alleviated by a reduction in pH from 7.0 to 6.5 (I50 increased from 0.14 to 0.32 μmol 1−1). AMP on the other hand was a more potent inhibitor at pH 6.5 but this inhibition was totally reversed under conditions of citrate, NH4+ and AMP typical of muscle during recovery from exercise in vivo. In purified white muscle enzyme preparations, FBPase demonstrated maximal activity at pH 6.5 whereas the optimal pH of PFK was 7.0 or greater. Indeed, it appears from these in vitro data that regulation by metabolite levels as well as pH are required for net FBPase flux in vivo. 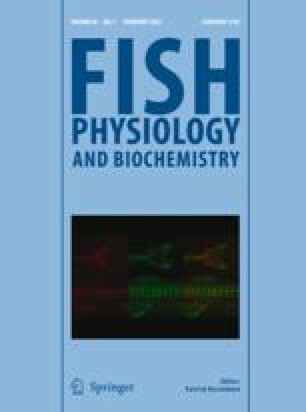 It is concluded, therefore that trout white muscle FBPase demonstrates the potential to play an important enzymatic role in the control of intramuscular gluconeogenesis in these animals. The results are discussed in relation to present knowledge regarding the metabolic responses of trout white muscle to, and its subsequent recovery from, exhaustive exercise.